Composer and producer/songwriter Tyler Bates (GUARDIANS OF THE GALAXY) kicks off 2015 with the release of Marilyn Manson’s new album and tour. Bates, who with Manson, co-wrote and produced Manson’s new record The Pale Emperor, which is receiving high praise from today’s top music journalists and fans alike. The first single, "Deep Six," is currently a hit at rock radio. Bates will serve as MD and lead guitarist on "The Hell Not Halleluja Tour." “Manson and I became friends through CALIFORNICATION, when he played himself on the show, and then performed together at the Greek Theater for the season finale episode a couple years ago. We got together for a casual creative session, which led to making the new album,” said Bates. The first few tracks of the collaboration between Bates and Manson have been released via Bates’ film and TV work. SALEM features the Manson cut “Cupid Carries a Gun,” from The Pale Emperor, as its main title theme, and the song “Killing Strangers” can be heard twice in the film JOHN WICK. 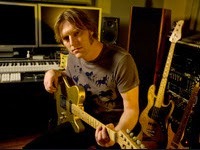 Tyler Bates is a Los Angeles-born composer who has scored sixty feature films, hundreds of episodes of television, and several major studio video games in addition to producing artist records. Bates has more than twenty commercially released soundtrack albums, several of which debuted number one at the box-office. Bates’ recent work includes the score for Marvel’s 2014 smash hit, Guardians of the Galaxy, co-writing and producing iconic shock rocker Marilyn Manson’s forthcoming album, The Pale Emperor and the score for Keanu Reeves 2014 hit, John Wick, directed by David Letch and Chad Stihelski. Bates’ boldly emotional score for James Gunn’s Guardians of the Galaxy is an integral component to what has become one of the highest grossing films of all-time. Bates' authentic approach drew the attention of the Guardians director, and Dawn of the Dead screenwriter, and led to scores for Gunn's horror-comedy Slither, and his comically tragic superhero classic, Super, before the two began their effort to bring Guardians of the Galaxy to the big screen. Bates also currently scores DirecTV’s new hit series, Kingdom, and WGN’s wickedly popular, Salem, both will be returning for their second season in 2015. Tyler Bates has collaborated with many of today’s top directors including Zack Snyder. Scoring Snyder’s Dawn of the Dead, 300, Watchmen, and Suckerpunch, solidified Bates’ presence as one of today’s top composers for film and television. The score soundtrack to 300 has sold 300,000 copies – making it one of the most popular score albums of the 21st Century. He has also worked with directors Genndy Tartakovsky, William Friedkin, Joe Johnston, Takashi Shamisu, Scott Derrikson, and Rob Zombie, with whom he collaborated on several films, including two Halloween films, The Devil's Rejects, Zombie's slapstick cartoon The Haunted World of El Superbeasto, as well as string arrangements on his album Hellbilly Deluxe 2: Noble Jackal. In addition to his film and television work, Bates’ scores for renowned titles such as God of War: Ascension, Killzone: Shadow Fall, and Transformers: War for Cybertron, have established him as one of today's top composers for video games. The emotional power of his music resonated with Atlanta bred DJ and Moustrap recording artist Le Castle Vania. An instant connection was made once the two were introduced, resulting in collaborations on Le Castle Vania's Prophication, released on Mousetrap/EMI records, founded by world-renowned electronic artist, Deadmau5. Marilyn Manson’s The Pale Emperor will be released on January 20, 2015. The Hell Not Hallelujah Tour, featuring Tyler Bates on guitar, Twiggy Ramirez on bass, Paul Wiley on guitar, and Gil Sharone on drums, kicks off on January 21st in Washington DC – to view the itinerary visit http://www.marilynmanson.com/.